CHANDRAGUPTA, aided very largely by the previous organisation of the great empire of Magadhā, was able, once he had gained the mastery, not only to remain in possession for the long period of twenty-four years (about B.C. 322-298), but to hand on the empire, with enlarged territory, to his son, Bindusāra. Of him we know almost nothing. The Ceylon Chronicles merely say that he reigned for twenty-eight years, and the Greeks, who call him Amitrochates (that is, Amitra-ghāta, foe-destroyer, no doubt an official title), only tell us that Deimachos was sent to him as ambassador by Antiokhos, and Dionysios by Ptolemy Philadelphos. A few sentences from the pen of the former are still extant. When he died, about 270 B.C., he was succeeded by his son, Asoka, then the Magadhā viceroy at Ujjeni, of whom the Ceylon Chronicles and other Buddhist writings, and his own inscriptions, tell us so much. The Greeks do not mention him, and the brahmin records completely ignore him until the time when, ten or twelve centuries afterwards, all  danger of his influence had passed definitely away. They then go so far as to include his name among others in a list of kings. When this was done the authors of it had no access to the Buddhist writings, and could not read the inscriptions. It follows that the tradition had been carried down, all the time, in the brahmin schools, though not one word about it had been allowed to transpire. "When in the thirties that most gifted and original of Indian archaeologists, James Prinsep, - clarum et venerabile nomen,  was wearing himself out in his enthusiastic efforts to decipher the coins and inscriptions of India, whilst the very alphabets and dialects were as yet uncertain, he received constant help from George Turnour of the Ceylon Civil Service. For in Ceylon there was a history, indeed several books of history; whereas in Calcutta the native records were devoid of any reliable data to help in the identification of the new names Prinsep thought he could make out. It is not too much to say that without the help of the Ceylon books the striking identification of the King Piyadassi of the inscriptions with the King Asoka of history would never have been made. Once made, it rendered subsequent steps comparatively easy; and it gave to Prinsep and his coadjutors just that encouragement, and that element of certainty, which were needed to keep their enthusiasm alive." (1). The Asoka Avadāna, in Buddhist Sanskrit, preserved in Nepal. (2). 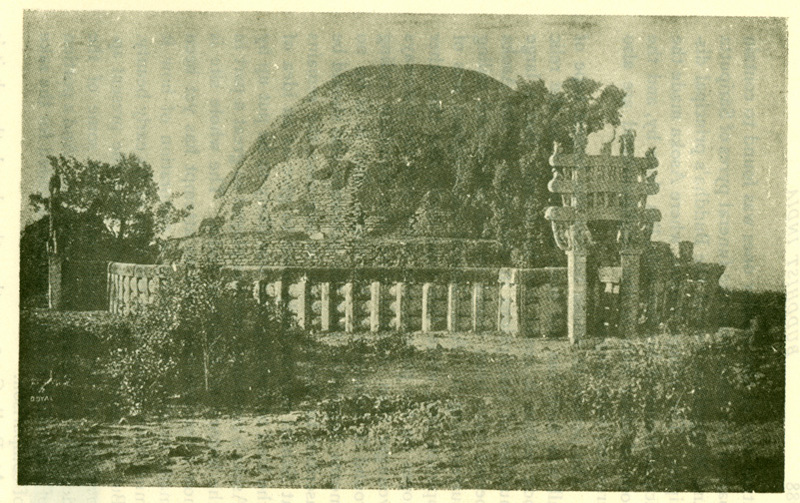 The Dīpavaṃsa, in Pāli, preserved in Burma. (4). The Mahāvaṃsa, in Pāli, preserved in Ceylon. Of these the first was composed in the Ganges valley. The author and date are unknown; but it is probably as late as the third century of our era. It forms one of a collection of legends called the Divyāvadāna. The exact force of this title is somewhat ambiguous. Avadāna means a story, but as it is used exclusively of the life-story of a person distinguished in the religion, the collection corresponds to the Vitae Sanctorum of the Christian Church. We  know so little, as yet, of the literature in Buddhist Sanskrit that we cannot form any clear idea of the method by which the tradition it has preserved was handed down. It is otherwise with the other three. We know that there were two great monasteries at Anurādha-pura in Ceylon, the Great Minster and the North Minster. There the canonical books were handed down, in Pāli; and commentaries upon them, in Sinhalese, interspersed with mnemonic verses in Pāli. In the third century of our era someone collected such of these Pāli verses as referred to the history of Ceylon, piecing them together by other verses to make a consecutive narrative. He called his poem, thus constructed, the Dīpa-vaṃsa, the Island Chronicle. The old verses were atrocious Pāli, and the new ones added are not much better. Then, as the old ones were taken, not from one commentary only, but from several, we get the same episode repeated in different verses. Added to this the work was supplanted in Ceylon by the much better-written book called the Mahā-vamsa, or Great Chronicle; and was completely lost there. The present text, which is corrupt, has been restored, in the excellent edition by Professor Oldenberg, from MSS., all of which are derived from a single copy that had been preserved in Burma. Shortly after the Island Chronicle was composed, the celebrated Buddhaghosa, a brahmin from Behar, came over to Ceylon, and rewrote in Pāli the old Sinhalese commentaries. His work supplanted the latter, which are now lost, and is the only evidence  we have of the nature of the ancient tradition. He quotes, from the old Sinhalese commentary, a number of the mnemonic verses also contained in the Island Chronicle, and gives us, in Pāli, the substance of the Sinhalese prose with which they had originally been accompanied. A generation afterwards Mahanama wrote his great work, the Mahā-vamsa. He was no historian, and had, besides the material used by his two predecessors, only popular legends to work on. But he was a literary artist, and his book is really an epic poem of remarkable merit, with the national idol, Dushṭa Gāmini, the conqueror of the invading hosts of the Tamils, as its hero. What he says of other kings, and of Asoka amongst them, is only by way of introduction, or of epilogue, to the main story. Fig. 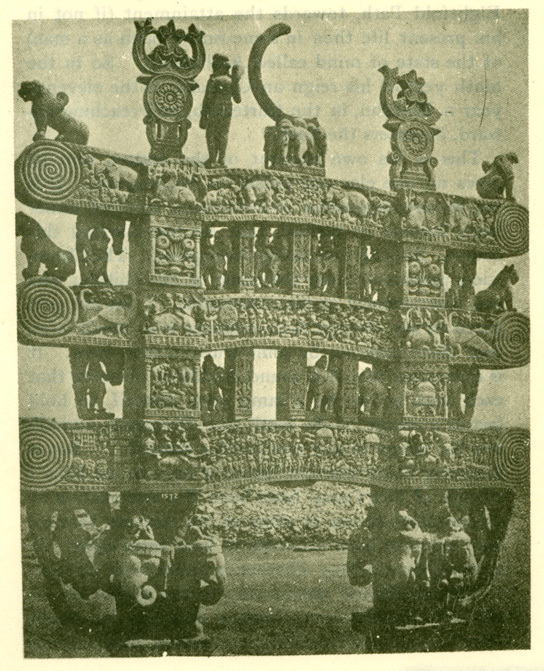 46 Details of the Sculptures on the Gates of Sānchi Tope. Champā. This may well be so. We hear nothing of his youth or early training. The Ceylon books all say that at the time of his father's death he was holding the position of viceroy at Ujjeni, and that he had there married a local lady residing at Vedisa, afterwards the site of the celebrated building now known as the Sānchi Tope. They had two children, a son, Mahinda, and a daughter, Sanghamittā. But as this was really a mesalliance, the lady being only of a merchant's family, she was left behind when Asoka left Ujjeni to go to Pāṭaliputta and there secure the succession. All the accounts agree that this was no easy task. His elder brother, the viceroy of Takkasilā in the Panjab, opposed him, and it was only after a severe struggle, and not without bloodshed, including the death of his brother, that Asoka made his way to the throne. The details of the struggle differ in the different stories, and there is a passing expression in one of the Edicts (all the more valuable because it is incidental) of brothers of the King being still alive well on in his reign. On the whole, I am inclined to believe that the tradition of a disputed succession is founded on fact. The Chroniclcs say that Asoka was not formally anointed king till between the fourth and the fifth year after Bindusāra's death, and the language of the Edicts, which are dated, whenever they are dated, from the formal anointing, and not from the succession, would harmonise with this. Fig. 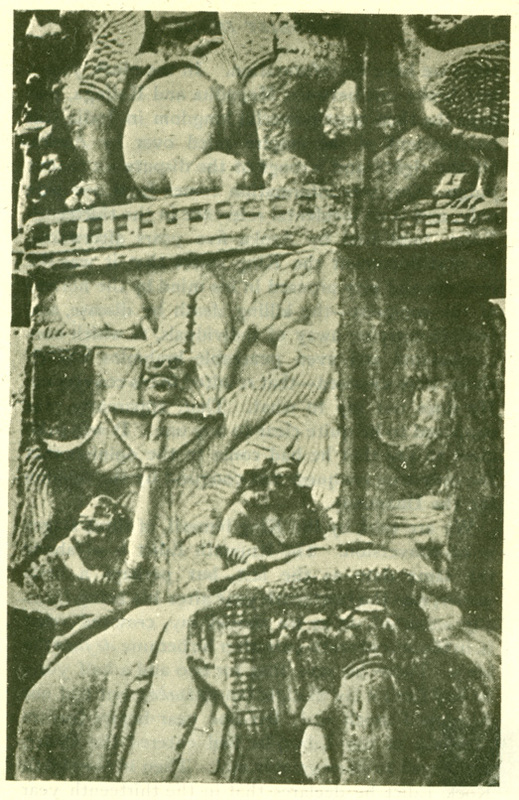 47 Details of the Sculptures on the Gates of Sānchi Tope. reign we have no information. In the ninth year a war broke out between Magadhā and Kalinga, perhaps the then most powerful kingdom in India still independent of the empire ruled over by Asoka. Of the rights and wrongs of the dispute we cannot judge. Our sole information comes from one side only, and is an incidental reference in the thirteenth Edict, published by Asoka five years afterwards. In that document the King states that it was the remorse and pity aroused in his mind by the horrors of the conquest - the killing, death by disease, and forcible carrying away of individuals, to which non-combatants and even peaceable brahmins and recluses were exposed - that resulted in his conversion. He does not say to what. That, apparently, was supposed to be quite clear to anyone. It was sufficient to say that he had come to the opinion that the only true conquest was conquest by the religion (by the Dhamma). Fig. 48 Rear View of the Northern Gate of Sānchi Tope. -that is to say, he had set out, along the Aryan Eightfold Path, towards the attainment (if not in his present life then in some future birth as a man) of the state of mind called Arahatship. So in the ninth year of his reign an Upāsaka, in the eleventh year a Bhikshu, in the thirteenth, still reaching upward, he enters the Path. ation one of the smaller ones was found to contain part of the ashes from the funeral pyres of Sāriputta and Moggallāna, two of the Buddha's principal disciples. The village Vedisa, where Asoka made the acquaintance of his first wife, lies close by, and the tops of other hills in the neighbourhood are also crowned with stupas. Fig. 51 Sānchi Tope. A General View from the South. known that Asoka built the original temple, it has been so often changed, and added to, that only a few fragments of railing, and probably the very remarkable sinhāsana, or throne, remain of the work done in his time. The present building has been restored, as a national monument, by order of the English Government. It will be noticed how different it is in outline from the ancient form, as shown in the illustration of the Sānchi Tope. This is due to a difference of ideal. The ancient tope was an enlarged and glorified circular burial mound. The later ones imitate an ordinary dwelling-hut, the outline of which was determined by the natural bend of two bamboos, planted apart in the ground, and drawn together at the top. 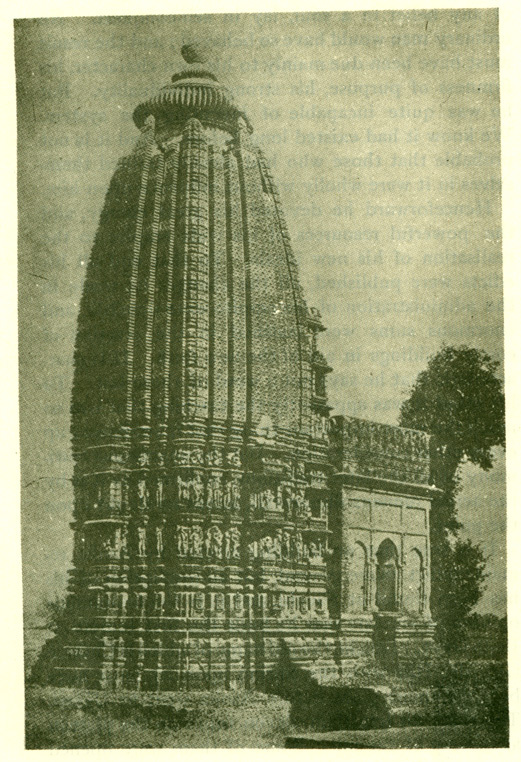 This shape is characteristic of all the mediaeval temples in India, and an illustration of the Jain temple at Khujarao is annexed, as one of the best examples of this style. But to return to Asoka's own doings. Fig. 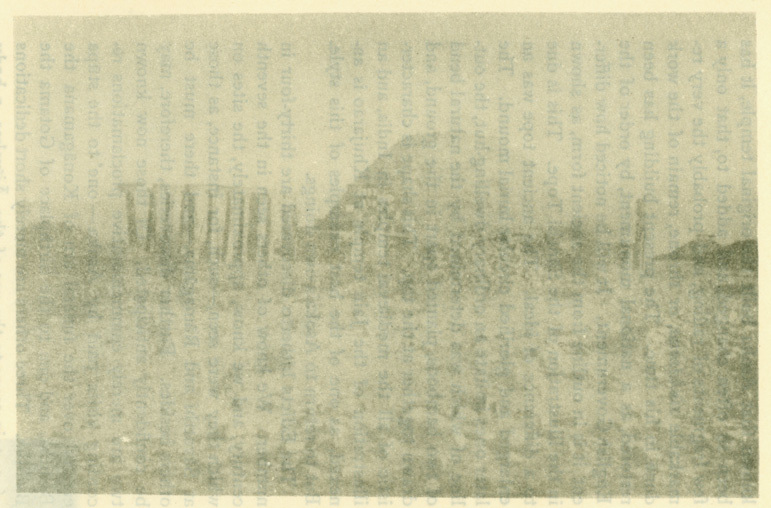 53 Rear View of the Eastern Gate of Sānchi Tope. the people we now call Buddhists (they did not call themselves so) were concerned so exclusively with the Dhamma, apart from ritual or theology, that their doctrine was called the Dhamma. It fell, naturally, for them into three divisions, quite distinct one from the other, - the theory of what it was right (good form) for the layman (the upāsaka) to do and to be, of what it was right for the Wanderer (the Pabbajita) to do and to be; and, thirdly, what the men or women, whether laity or Wanderers, who had entered the Path to Arahatship, should do, and be, and know. On each of these three points their views, amidst much that was identical with those generally held, contained also, in many details, things peculiar to themselves alone. Now the Dhamma promulgated by Asoka was the first, only, of these three divisions. It was the Dhamma for laymen, as generally held in India, but in the form, and with the modifications, adopted by the Buddhists. It was not only within the boundaries of his own empire that Asoka tried to spread the Dhamma. In the thirteenth Edict, in about 255 B.C., addressed to his sons and grandsons, after declaring that he himself found pleasure rather in conquests by the Dhamma than in conquests by the sword, he says that he had already made such conquests in the realms of the kings of Syria, Egypt, Macedonia, Epirus, and Kyrene, among the Cholas and Pāndyas in South India, in Ceylon, and among a number of peoples dwelling in the borders of his empire. Here, fortunately, the Chronicles come to our assistance. In a curt record they give us the names of missionaries sent out by Tissa, the son of Moggali (the author of the Kathā Vatthu, and the president of the 3rd Council held in Asoka's reign and under his patronage). They were sent to Kashmīr, to Gandhārā, to the Himālaya (Nepal or Tibet), to the border lands on the Indus, to the coast of Burma, to South India and Ceylon. Each party consisted of a leader and four assistants. Of the five missionaries to the Himālaya region three are named as Majjhima, Kassapa-gotta, and Dundub-hissara. Now when Cunningham opened the Topes (brick burial mounds) at and near Sānchi he discovered under them several of the funeral urns containing ashes from the funeral pyres of the distinguished persons in whose honour the Topes had been built. One of the urns has inscribed round the outside of it, in letters of the 3rd Century, B.C., the simple legend: "Of the good man, Kassapa-gotta, the teacher of all the Himālaya region." Round the  inside of the urn is the legend: "Of the good man, Majjhima." In another Tope close by at Sonāri two urns bear the separate inscriptions: "Of the good man, Kassapa-gotta, son of Koti, teacher of all the Himālaya region," and: "Of the good man Majjhima, the son of Kodini." In the same Tope was a third urn with the inscription: "Of the good man Gotiputta, of the Himālaya, successor of Dundubhissara." Fig. 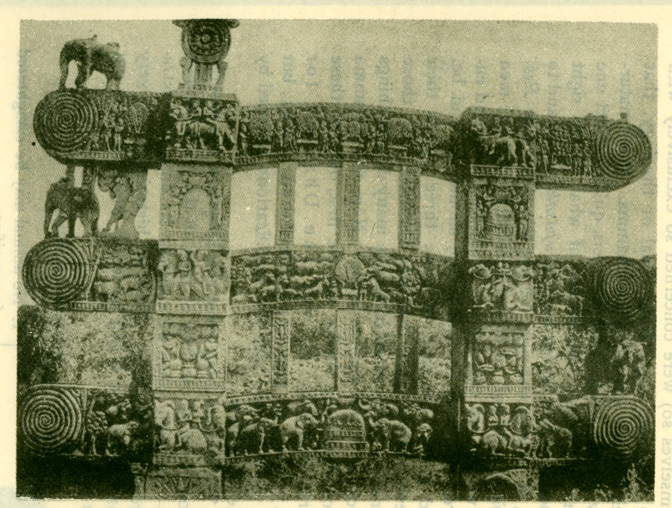 54 Details from Eastern Gate of Sānchi Tope. So Asoka mentions a mission to Ceylon. But it is his mission. No credit is given to any one except himself. He merely says it was successful, and gives no details. As we might expect, the Chroniclers of the island give names and details, which they work up into a picturesque and edifying legend. Its central incident is the transplanting to Ceylon of a branch of the tree at Bodh Gayā under which the Buddha had achieved enlightenment. 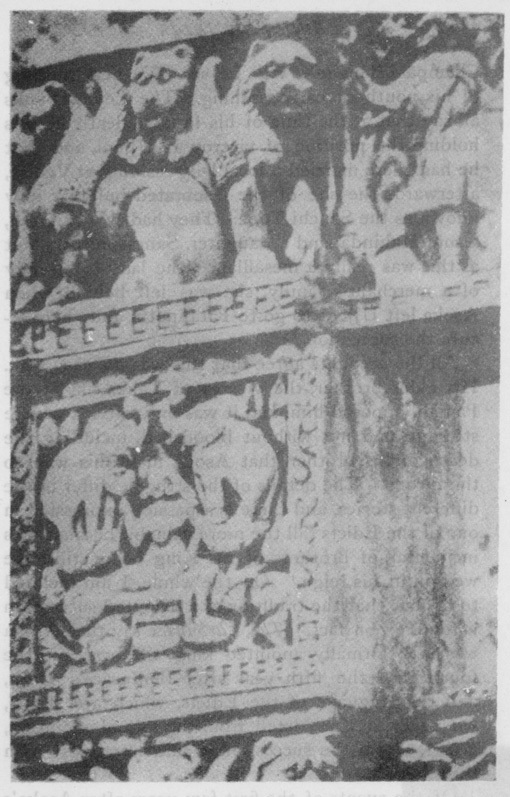 Now this event is portrayed on two curious bas-reliefs on the Eastern Gateway at Sānchi, which must be nearly as old as the event itself. In the middle of the lower picture is the Bodhi Tree, as it stood at Gaya, with Asoka's chapel rising half-way up the tree. A procession with musicians is on both sides of it. To the right a royal person, perhaps Asoka, is getting down from his horse by the aid of a dwarf. 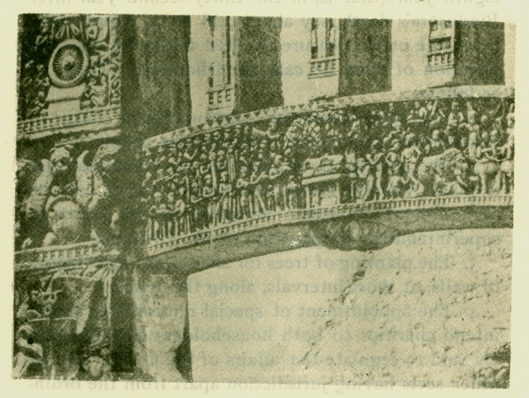 In the upper picture there is a small Bodhi tree in a pot, and again a great procession, with to the left a city, perhaps Anurādhapura, perhaps Tamralipti, to which the young tree was taken before it went to Ceylon. 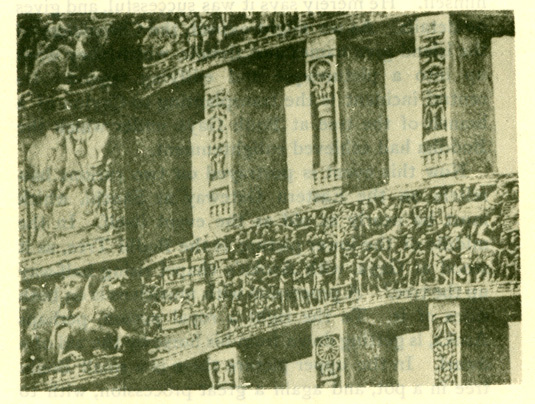 The decorations on either side of the lower bas-relief are peacocks, symbolical of Asoka's family, the Moriyas (the Peacocks); and lions, symbolical of Ceylon, or of the royal family of Ceylon (that is, of Simhala, the Lion island). Opinions may differ as to the meaning of some of the details, but there can be no doubt as to the main subject. Fig. 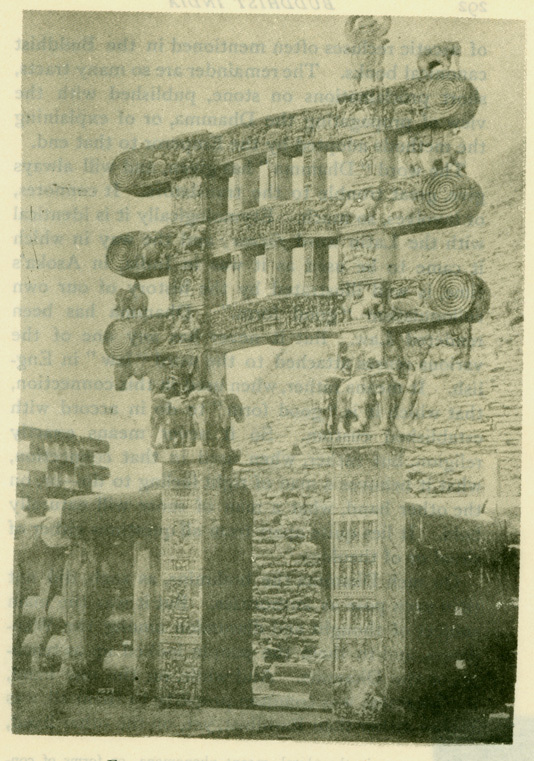 55 Details from Eastern Gate of Sānchi Tope. See now on these Chronicles Professor Geiger's important researches in his Dīpavaṃsa ami Mahāvaṃsa. Erlangen, 1902. Dīpavaṃsa, chap. viii. ; Mahāvaṃsa, chap. xii.